AFP, Mar. 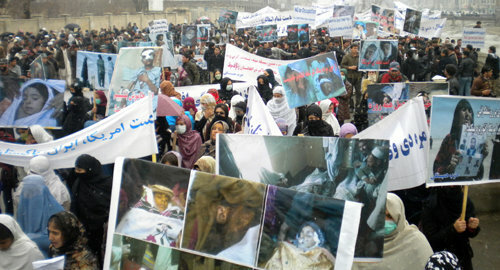 6, 2011: About 500 people poured onto the streets of Kabul earlier on Sunday and chanted anti-American slogans over the deaths of the children. 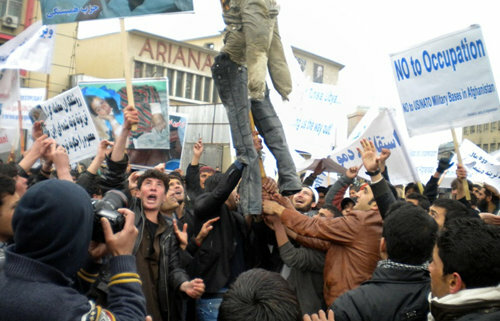 Marching through central Kabul they shouted "Death to America -- Death to the invaders." A placard carried by a veiled woman read: "Occupation = killing + destruction." Reporting from Kabul, Afghanistan, and New Delhi— Hundreds of Afghans demonstrated Saturday against the accidental killing of a 15-year old boy by U.S. forces in a volatile eastern province, leading to the death of at least one protester. The boy's death occurred late Friday evening in Nangarhar province after he was shot while attempting to pull a gun on Afghan and U.S. troops participating in a mounted patrol. Saturday morning, local villagers carried the body to a local administrative center where angry protests broke out. Demonstrators started throwing rocks, then burned police vehicles before some fired on police, according to local reports. The police then fired back, leading to at least one casualty. The Nangarhar governor's office and the provincial police chief said they have dispatched a team to the district to investigate. The inadvertent killing of Afghan civilians by foreign troops is a major irritant between Western allies and Afghan President Hamid Karzai, undermining a joint bid to win the "hearts and minds" of ordinary Afghans in the fight against insurgency. District Gov. Abdul Khaliq Mahroof told the Reuters news agency that at least one protester was killed and three injured in the demonstration after police returned fire. He said armed insurgents had mixed into the crowd, adding that he didn't know whether those shot were the same people who had fired on police. The NATO-led International Security Assistance Force confirmed in a statement Saturday that its troops had mistakenly killed the boy while on a mission with Afghan soldiers to capture a Taliban insurgent in Hesarak district. Afghan and foreign troops ordered the boy to come out of his room so they could search his compound for an unnamed Taliban leader, according to the statement. The boy, who kept a shotgun and a pistol near his bed, reached for one of them. "As a force protection measure, a security force member engaged the individual, resulting in his death," the statement said. "After initial assessment, it was discovered the individual was a local 15-year old male." Weapons are prevalent in Afghanistan, particularly in lawless rural areas where they are kept for protection against thieves. The killing was the second such incident in Nangarhar this week. On Thursday, foreign and Afghan troops killed a policeman and a girl during a raid on their compound. Violence in Afghanistan is at its highest level since U.S.-backed Afghan forces overthrew the Taliban nearly a decade ago. The worsening security climate comes as the U.S. discusses drawing down troops and turning over more responsibility to the Afghans. This month's killing of Al Qaeda leader Osama bin Laden in Pakistan has strengthened calls in some Washington policy circles to speed up the U.S. withdrawal. A U.N. report released this year identified 2010 as the most lethal year for Afghan civilians, with some 2,777 killed, a 15 percent hike over 2009. While the report blames insurgents for three-quarters of the deaths, civilian fatalities at the hands of foreign troops cause the greatest outrage in local communities. Long considered one of the most stable and peaceful parts of the country, the northern provinces have seen rising violence as heavy insurgent activity has spread to 80 percent of the country - up from 54 percent two years ago.